IP Address Locator - Where is this IP Address? Our IP Address Locator lets you find out the location of over 16,000 IP Addresses per hour for free – no registration, no captchas, no keys required. Both robotic and human IP Address lookups are welcome. Optionally deep link directly to the IP Address Locator results. AJAX, JSON, and JSON-P all supported. Scroll down for a list of nearby cities and a map. Here is a code sample showing how to use this service programmatically. Nice redesign. Too bad it doesn’t work. I was just wondering what the issue was that you encountered – specifically whether it was just a transient issue or whether it is still there, and is something that I have missed. Any further feedback would be very much appreciated, as I am really trying to make this useful for everyone. Thanks for your feedback – I was just wondering specifically what issue you were referring to when you said it didn’t work. I would be grateful if you could confirm if the issues persists, and if so, if you could please provide a hint as to the nature of the issue that you have encountered. In any case, I am keen to help, so please let me know if I can assist further. This site no longer works … ugh … why do people destroy things just because they want them to look better! There is nothing to click on after entering the IP! No way to find a location with this site! So if you’re the one who changed it, you really screwed up! In any case, if you are experiencing difficulty, then no doubt others are too, so as a possible fix, I will put a submit button on there that will force a lookup of whatever is currently in the “lookup box” and then see how that goes. Once you see that, could you please let us know particularly if that does not work for you. Now you can either, select from the drop-down list, press enter, or click submit. Does that work for you guys? Working perfectly now. Thanks for the fix! 1. I arrive here, but only see my own IP. 2. Go back, copy the IP manually and paste it in the “Address to locate” box. Press submit. 3. The location is shown, but only in the “Address to locate” box, as a “bubble” or pop-up. All the information below is still about my own IP address. 4. Finally learned that I need to click the bubble to populate the remaining fields with the full info for the IP I am searching. It works, but it’s not intuitive and I am sure that it’s more clicks to get where I’m going. Nice redesign, thank you for the free service. Doesn’t seem to be quite there (as good as before) yet in functionality. Cheers. I am in Virginia and it reports Florida, Way Wrong!!! doh! – sorry I will get that fixed. btw you can post corrections here (http://www.correctgeo.com/), and they automatically go in to the next weeks map build. OK, I think that I have identified the problem, and I am working on it. The following code has worked for months. Why has it suddenly stopped working? We only do about 2 to 10 lookups per day, if that. Note…. $ip is obviously the IP ADDRESS we’re passing in. Something is wrong, I can confirm. I cannot anymore search for IP geolocation. It simply doesn’t work. Should I look for an alternative? As that will achieve the same result, and you get 16,384 look ups per hour for free – rather than the 20 free lookups that you received previously. I am keen to help, but I am unsure of what you are referring to. Could you please provide us with an example of specifically what does not work? (remove spaces in string above) Essentially, you need to add http:// at the start, and remove the callback=callback parameter in the query string. With regards to the getIP() function – it really depends on what you are trying to do. If you are not concerned with someone trying to spoof their location/IpAddress, but rather your priority is on accurately locating your typical site user, than using getIP() adds value, and in any case, not using it does not really help in either scenario. oh OK – I see…. Someone from Vietnam has been trying to get into my Tivo acct. Probably trying to add subtitles to all the programs I record. Thanks for the service! I stopped using your site a couple of months ago and never went back to this discussion. There was no “Submit” button on the IP locator page last I checked, and hitting Enter had no effect. Now I see you fixed it. Yes, thanks again for your valuable feedback – I had not noticed the problem as I had always selected the IP Address from the drop down list, but upon having it pointed out to me, I agree that it was definitely a problem. It is great to have it fixed now, and I am even using the submit button myself. BTW – I also wired enter key to the submit button – which I am finding easier than having to reach for the mouse. It you have any further suggestions for improvements, then please let me know. setup a full mysql database of local content to query. Is there a way to query still with cmdline? In any case, please let me know if I can assist further. ahh, excellent! This is exactly what I was missing and this helps a ton. 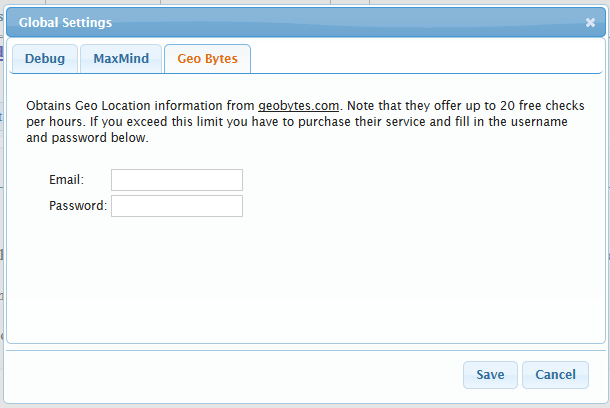 I am attempting to purchase mapbytes. Half of the time, I get an error saying “action failed” when I attempt to add the item to my cart. The other half of the time I get a message saying that I have successfully added it to my cart, but when I go to my cart, the cart is empty. Please correct me if I am wrong, but I believe that Ferg worked around this by using the PayPal Buy Now buttons that you see in the right hand margin of each page. In any case, just for the benefit of other readers, the PayPal Buy Now buttons are replacing our previous shopping cart facility – the remnants of which are very soon to be completely removed from our site. So the PayPal Buy Now buttons are now the way to go. I was testing geobytes to use here at our office. I used the code provided above. I am receiving data when I submit an IP address, but the data coming back is wrong. For instance, I enter one of our IP addresses 96.90.18.154 and it comes back to Melbourne, AU although we are located in Tallahassee, FL USA. I tried the address of 1&1 which is located in Wayne, PA USA (74.208.255.133) and your code returns “New York, NY” (I get the same results if I enter these IP addresses directly into this page). When I try the addresses on other IP lookup sites, they come back correctly. Thank you for the two corrections – I have updated our IP Address Map database accordingly, and the corrections will be visible from our web site by next Monday night, if not before. With regards to why they were wrong in the first place, both errors were the result of us having very little data for these ranges – most likely due to the fact that very little out bound traffic originates from either IP Address. In any case, thanks again for the corrections, and please let me know if I can assist further. I don’t know what’s wrong but your ip to city database is corrupt. Many ip’s from brazil tell me they are in Los Angeles. I check on other ip location services and they get it right. Would you be able to please post the IP Addresses in question, and I will look in to each case, and update our database as may be required. You may also wish to post any errors that you may find to http://www.correctgeo.com/. I am not sure if it applies in this case, but with regards to the other ip location services agreeing with each other… This raises suspicion that they are all using the same data source in this instance – which I would expect is the NICs whois database. In any case, I would recommend caution in making a determination of accuracy based on either a small data set or on just collaboration between providers – particularly where the determination concurs with “WhoIs data”. One only needs to consider what it is that the Internic’s who is records are recording to understand that they will be wrong a signification proportion of the time. This is because the Internic’s who-is records only record the city where the ISP is located, and not a list of the cities where that ISP’s infrastructure is used. And as I am sure that you are aware, many ISPs service tens, hundreds, and even thousands of cities – so you can see that for anything but a single city ISP, the whois record is going to be wrong most of the time. So while I accept that our map’s determination may sometime be wrong, I recommend that when testing the accuracy of each provider, you check the errors against whois and if they concur then do not consider that any recommendation, as it probably just means that they did not have any other data source for that address and are just falling back to whois data. In any case, thanks for letting us know abot the errors, and please let me know if I can assist further. Some errors I found today. Please help us how to correct this wrong format. Thanks for the correction – I appreciate it, and have updated our database accordingly. The correction should be visible from our site here as of next Monday night. If you identify any others, then please either post them here, or here: http://www.correctgeo.com/. Cable modem @ home / Suddenlink. This week, my IP address is 75.110.106.45. I’m in Nashville, NC, “The Original Nashville.” At least that’s what the sign says on our main road. Yes, no relation to Nashville, TN. Usually, geolocators say I’m in Rocky Mount, NC, as does Geobytes traditionally. But today, Geobytes puts me in Wilson, NC, which I’ve never seen a geolocator do before. Geobytes is alone in placing me in Wilson, NC. The pie chart is an interesting strategy. The slimmest slices of the pie chart are unlabeled, or are labeled with only a half-a-letter. With the Firefox page-zoom and text-zoom set to 100%, there is also overrun of the labels, and some labels are hard to determine which pie-slice they refer to. Reducing the Text Zoom to “Tiny,” the overrun is mostly solved, but the unlabeled or partially labeled slices do not reveal additional letters. And the kicker is that Nashville (NC) is not represented in the pie chart (as far as I can tell) or the table of possible locations. Half a year ago, no geolocation services recognized I am in Nashville (NC). Today, 1 out of 10 correctly places me in Nashville (NC), which I guess is an improvement. But since GeoBytes was my first geolocator, and because there’s some interpersonal dialog, it’s become my favorite, and I’d like to see it get ahead. Interpersonal dialog — if you start me up. Also, if I type too fast, it tends to come out “geolactator,” which hasn’t even been invented yet. But I guess that’s something I’ll have to work out on this end. Assuming the geolactator returns “the location where you’d like to be,” I’d like to be the first entry in the database by saying “the Canadian Rockies.” Better yet, the Canadian Rockies in a different dimension. Thank you for the correction, and your kind words. I have updated the location of the ip address you provided to Nashville, NC, United States – It will be visible from our site here on Monday Night. With regards to the pie graph, you may have already found this yourself, but in any case the easiest way to see the full location that a slice represents, is to click on the slice, and then read the location from the table below – as it updates to whichever slice you click on. As for a “geolactator” – I hate to think what it might be, but if they do ever invent one then I would give it a wide berth. In any case, thanks for your support, and please let me know if I can assist further. Pretty fast response time from you; thanks. I described some problems I’m having with the pie chart, but I edited my previous post to describe them. I’ll try to highlight that section. Gives incorrect location for 67.165.122.96. Should be Spokane, WA but gives Olympia… 100’s of mile away. Tried several other sites and they are correct. Doesn’t work anymore: The free service has moved. Please see http://geobytes.com/free-get-city-details-json-p-api for details of our free service. and on here it has my location as Miami, Florida, whereas other sites have it wrong as well but their wrong location for my IP address is New York. MY CORRECT LOCATION IS: MODESTO, CALIFORNIA……which is no where even near any of the locations listed under my IP address!! How do I change correct this problem or do you fix it? Do I need to go to other sites to have it fixed/changed or will fixing my location here take care of it completely? Thank you for any help. Thanks Sabrina, I have posted your correction to http://www.correctgeo.com/ so it should make it in to our database with a couple of days. With regards as to how to get other IP localization services to update their database – other than posting to http://www.correctgeo.com/ I don’t know of any other service that is trying to centralize this, so unfortunately you will have to correct them individually as you find them. In any case, thanks for letting us know about the error, and please let me know if I can assist further. The original service – at 20 free look ups per hour, was intended to be used manually, but as people started using robots to access the service we try to support that by adding templates, and this would have been fine if people had limited there robots to us the free 20 lookups per hour. However, some people just let there robots bash away at the page, at un-imaginably high rates so we have had to move this traffic to away from our primary web site – hence the move. However, we are keen to provide the service that people require, so the new location has been built to handle very high load – and that is why we have been able to increase the free look ups per hour from 20 to 16,384 accesses per hour. So while it is a pain to have to update your code – we hope that you will agree that it is worth it. Thanks Pungh, I have posted your correction to http://www.correctgeo.com/ so it should make it in to our database with a couple of days. Hopefully other providers will update their records form there also. Hi. I’m not certain whether or not you continue to intend to provide the ability to link to the output from this page, but at present the link you provide to “Link to these results” produces an error message. Thanks. 5.22.129.162 is reported as Lebanon but it’s in Tel Aviv. Any plans to allow lookup of IPv6 addresses? My attempt just now resulted in an empty reply. It says Amsterdam 100% and I am in Madrid XD This Website doesn’t work at all! I recommend that you do perform your own evaluation, but I would not recommend using WHOIS as the arbitrator. In fact I would be very suspicious of any provider that consistently concurs with WHOIS data. The purpose of the WHOIS data is to identify the entity (person or company) to which a block of addresses have been delegated. It is essentially an ISP Map, rather than an IP Address Map. While the granularity of the Geobytes map, is that of a single subnet – placing each subnet individually within the geographic area that it services, the WHOIS data has a granularity of “company” (or ISP), placing all subnets “allocated” to a given ISP in the same geographic location. Compounding the problem further, the large and successful ISP’s that carry the bulk of the Internet’s traffic tend to service wide geographic areas. Given these points and the fact that the WHOIS data will locate all of an ISP’s address space to the same city, then it is difficult to see how the WHOIS data, even if it was kept up to date, could be geographically accurate. On the other hand, the purpose of the Geobytes map is to map IP Addresses to geographical locations. To achieve this we acquire seed data from a number of sources. All of these sites ask the web surfer to provide their geographic location, and this location along with the user’s IP Address is forwarded to us as seed data. We then run this data through a series of algorithms which identify and extract collaborating seed points. In addition to accuracy, the problem with using WhoIs data is that it contains phantom addresses – addresses that have been allocated but are not used. (Addresses that are not configured in any ISP’s BGP router tables.) Only about 10% of the theoretical 4 Billion IP addresses are actually routable across the net. The remaining 90% will make it as far as your ISP’s BGP router and then go nowhere. What this means is that a WhoIs based database will have to be 10 times larger than it would otherwise need to be. Can this be used for multiple IP’s at the same time. Its for a internet radio station. Normal around +/- 100 different IP’s continues listening. Listeners change so also the IP’s change very often. Just need a script to see the actual IP’s and there country’s that are listing. Can this be used for multiple IP’s and there location? Would like to use it for a internet radio station. Mostly around 100 a 200 listeners and so many different IP’s that change very often. The IP’s and there country on one page thats refresh every 1min would be a great tool for our radio. I am trying IP address 31.13.76.68, belongs to Facebook. All the other geolocation providers show it as United States. Why does GeoBytes report it as Moscow, Russia? Hi there, I’ve been using this script for a while but it looks like it recently stopped working. Accessing from Spain, it detects locations like Yemen or India. Any idea of what happened? Thanks! Is it possible to return Daylight Time in timezone? so that 192.168.x.x addresses etc are stopped. Is there a method for correcting incorrect location information for an IP record on your service? I have some records for our company that I would like to get updated. AJAX, JSON, and JSON-P all supported. Scroll down for a list of nearby cities and a map. Any way I can go back to the old design of this page? I’m pretty fond of it. 🙂 Cheers anyway. Can it be a little faster? 0.2s max? IP Address lookups are welcome. Optionally deep link directly to the IP Address Locator results. How to find the exact location with IP address??? The following code has worked for months. Why has it suddenly stopped working? Is there a method for correcting incorrect location information for an IP record on your service? When checking an IP address on your system, it gives a different location than 3 other checkers (which all agree with each other) do. Why is that? Hi, I am the isp provider for subnet 74.114.16.0/21 and you have wrong information, how can we correct the situation? Are you using an other database? I have been trying for 8 years to get our IP address block listed correctly by GeoBytes. We are located in Texas but GeoBytes always lists our location as Grand Rapids, Michigan. s there a method for correcting incorrect location information for an IP record on your service? I have some records for our company that I would like to get updated. Finally an IP locator that works! I have to check a lot of IP addresses. This tool make it a breeze to do so. I’m using this IP address 174.108.7.23 to track someone who has been cyber-stalking me. I have been cornered by police twice after the cyber-stalker used my personal information to impersonate me and threaten law enforcement. I know this is somewhat of an odd story to explain, but I sure could use some help. When entering an IP Address, an auto-complete drop down list will appear containing adjacent subnets along with the cities that they service. However, this automatically changes once you enter the 3rd dot in the IP Address, at which time the drop down list will repopulate with a list of cities that are also serviced by the same IP Address's subnet. Clicking on a slice of the pie will update the list of near by cities, the map, and the form containing the selected cities details to reflect the selected city. The "Link to these results" link is now just above the map. You can use it to deep link to the page pre-configured with the current results. The alternative locations, and specifically the percentages indicated, are an indication of the proportion of the origin data that we have for the given IP Address's subnet - weighted by factors such as the age, source, and consistency of the data. With the arrival of the new site, we have been able to dramatically reduce our prices, and introduce a number of new free services.